The colorful, sentimental, funny, affectionate, cantankerous memoir by the most colorful, funniest, most cantankerous-- and probably the most revered-- sportswriter of the last fifty years. Dan Jenkins is accepted as one of the greatest (if not the greatest) golf writer of all time, wrote beloved bestselling novels and abused more corporate expense accounts than anyone who ever lived. It's a touching, laugh-out-loud tribute to the romanticism of old-time sportswriting-- and the glory days of sports. As Dan Jenkins says in the first few pages of his memoir: "Sometimes, I envy my own childhood." A lot of us can say that about Dan's entire life. He grew up in the Great Depression, but he doesn't seem ever to have been depressed. He was too busy having fun and enjoying life. In His Ownself, we now get to share in the fun. Dan takes us back to his youth in Texas and his eccentric, wealthy mother-- with whom he never lived; he lived with his grandparents while his mother flitted in and out of his life-- and his sports fan father, whom he barely knew. We see Dan's growth as a sportswriter-- from his high school paper through to his first job at the Fort Worth Press-- and we understand what it was like to be a sports fan in Texas (it basically meant understanding a lot about passion, religion, heroes, and drinking). And then it's on to the glory days of Sports Illustrated, the most entertaining and most star-studded pages in the book. Dan was one of the handful of writers who made SI what it was for so many decades-- the most important sports magazine ever. Not coincidentally, Dan was also at the center of New York night life in those days-- hanging out at Elaine's while swapping stories with politicians and movie stars and New York's best writers and best bartenders. Above all, this is a sports nostalgia fan's dream book. And, in particular, a golfer's dream book. There are two chapters on Ben Hogan, whom Dan knew well-enough to play many rounds of golf with. There are up close and very personal looks at Byron Nelson, Palmer, Nicklaus, Tiger. Dan has covered every Masters and U.S. Open and British Open for the past 40+ years. He takes us behind the scenes of those tournaments to capture the drama, the humor and the absurdity of those events. 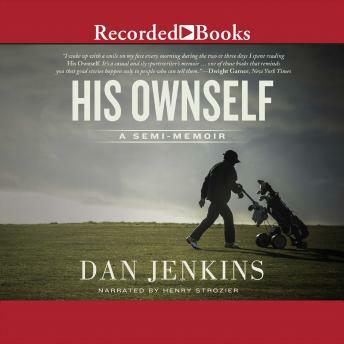 This book is Dan Jenkins remembering, spewing and mouthing off about everything under the sun-- politics, hypocrites, political correctness, the past, the present, Hollywood, money, athletes-- and, of course, writing the way very few sportswriters have ever been able to write.